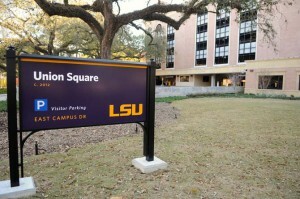 The LSU Law Center does not govern parking on or near its campus and no longer receives guest discounts for parking spaces. LSU Parking and Transportation Services is now solely responsible for managing event parking on campus, including payment collection. Therefore, LSU CLE can no longer accept pre-payment for reserved parking spots for its seminar attendees. Attendees must pay for parking in accordance with the LSU Parking and Transportation policies and procedures found here. We recommend parking in the Union Square Garage (see #9 on the map) or the X60 Lot (see #8 on the map). WARNING: Parking is limited. Our seminars may be competing for garage space with other campus events. We recommend arriving 15-30 minutes early. Directions to the Union Square Parking Garage can be found here. Click here to view/print directions to the LSU Law Center. The directions will include a map of available parking, including the Union Square Parking Garage next door. Click here for a list of Baton Rouge hotels.